Freight+Volume is very excited to announce Robert Hodge's first major solo exhibition in NYC, Rhythm for the Suffering. 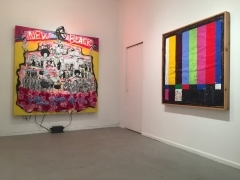 Following a two-month residency at San Antonio's Artpace, as well as a winter project at Arts+Leisure, the artist presents a new body of allusive multi-media work, probing themes of cultural identity and resilience within a framework of dynamically layered narratives and source materials. Robert Hodge's work is recognizable by its intense, self-assured materiality. Assembled from a wide range of found and reclaimed materials, the work’s heavily textured surfaces are immediately enticing, and their distinct tactility beckons the viewer to engage. 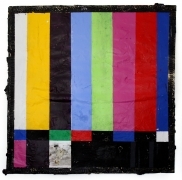 Relating his practice to Robert Rauschenberg's desire to work in the “gap” between art and life, Hodge pairs urban detritus with symbols and pronouncements drawn from a rich cultural tradition, forming a nuanced duality wherein fragments of everyday urban life become conduits of artistic expression. 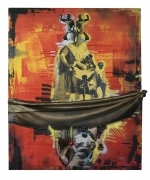 He embraces chance and the possibilities suggested by his materials, engendering a dynamic push and pull between his own creative voice and the urban debris that he integrates into his work. 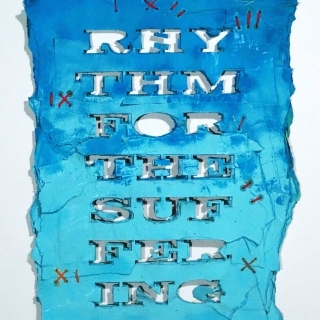 The titlle pieces of the exhibition, Rhythm for the Suffering (Blue, Green, Yellow, and Red), consist of thickly matted paper cut out with text, which the artist embellishes with paint and stitch-work with colored thread. Built up from countless layers of found newsprint, posters, and other ephemera, they take on a solidity that resembles a surrogate wall marked with graffiti, with the fragile individual pieces of paper subsumed into a concrete whole. 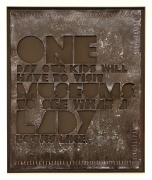 Behold a Lady has a similarly weathered appearance; tar paper is given the look of oxidized metal, a striking counterpoint to the contemporary appearance of the cut-out text's font. Though the surfaces of these paper assemblages recall everyday urban dereliction, they possess a certain memorial-like quality - an understated yet dignified monumentality. As in much of Hodge's work, the suggestive materiality of his practice evokes its own narratives, which run parallel to the themes alluded to by his choice of texts and imagery. The idea of resilience underscores Rhythm for the Suffering, uniting both Hodge's artistic methods and the prevailing themes they express. There is resilience through the act of reclaiming and strengthening materials that have been cast off and discarded by society, materials that have been deemed no longer worthy or declared to no longer have value or meaning. His choice of texts, drawn from song lyrics (particularly hip-hop), resonates strongly with this theme, communicating a sense of energetic perseverance and optimism, albeit guarded, for the future. As reflected in the exhibition's title, though there is suffering, it is still possible to celebrate and enjoy life, a notion explained by Hodge's sentiment that “while I’m going through my personal tragedies, failures, and adventures, I’m going take it in stride...happiness is a choice.” Blessings on Blessings on Blessings embodies this perspective, providing a mantra-like affirmation of everything there is to be thankful for. 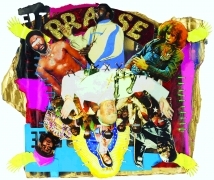 Using a layer cake as a metaphor for the complexity and richness of the African-American experience, Pound Cake also builds on the theme of resilience; while commemorating the past, with cutout imagery ranging from Zulu warriors to contemporary rappers, it simultaneously looks to the future, embodied by a neon sign spelling “New Black” affixed to the top. 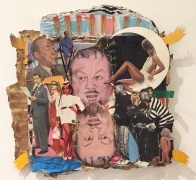 Born in Houston, Texas and raised in the City’s Third Ward district, Robert Hodge studied visual art at the Atlanta College of Art and more recently at the Skowhegan School of Painting and Sculpture. He has exhibited his work in numerous national and international institutions, including Artpace (San Antonio, TX), Arts+Leisure (New York, NY), PEVETO Gallery (Houston, TX), Boyd Satellite Gallery (New Orleans, LA), the Project Row Houses (Houston, TX), Museum of Fine Arts (Houston, TX), Contemporary Arts Museum (Houston, TX), New Gallery of Modern Art (Charlotte, NC), Coma Art Space (Los Angeles, CA), and Contemporary Museum of East Africa (Nairobi, Kenya). 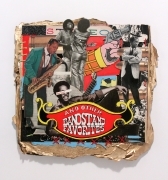 Named amongst the Houston Press’ 100 Most Creative People in 2011, the artist has also received grants from the Joan Mitchell Foundation, Houston Arts Alliance and The Idea Fund. Freight+Volume will feature Robert Hodge in a solo project at VOLTA Basel 13 from June 12-17, 2017. Hodge currently lives and works in Houston. 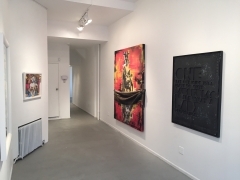 Please join us for the opening reception with the artist on Saturday, April 29th from 7 to 10pm. Refreshments will be served. 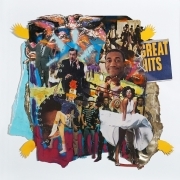 A full-color, limited edition artist's book will be available for sale. For further information, please contact nick@freightandvolume.com, or call 212.691.7700.